Today M.C. Nugget was kind enough to offer to wash my car. This is something I always accept with glee. I often add a token grin and run over to throw my arms around him too. But you see, this was BIG for me. Because even though I am a clean person, for some reason I don’t get around to washing my car often. I’m not sure why, because when I owned my own condo, my place was always immaculate and presentable enough even for pesky surprise guests. But when it comes to my car it’s bad. Really bad. It’s like a mental block. The only problem was he wanted to wash my car at a time when I needed to go to a nearby pilates studio and “observe” an exercise class by one of my favorite instructors. (I planned to steal her routine and use parts of it in my classes). Have I told you what a good guy Nuggie is? I suggested with a coy little grin how we could possibly still make everything work, if he were to one-up his favor and drop me off near said exercise class. He’s a good guy, you guys. I went to observe the class dressed in my workout attire, because… duh. I’m an instructor extraordinaire. I immediately jumped at that, because when this happens, and you’re offered a FREE CLASS, you just DO IT. The thing I hadn’t factored in was my walk home afterward, in the HOT sunshine. Don’t anybody panic for me. I know you were already beading up with sweat over this, but I was FINE. I got home and proceeded to eat a healthy Weight Watcher’s Smart One (a favorite of mine). I hadn’t eaten all day, and it was afternoon before I got home. It was yummy and all, but I was HUNGRY. Somehow, when I am tired and depleted from a rigorous workout something this always happens: Peanut Butter popped into my mind. I know. Not the healthiest of foods when one is in a constant war against hormonal weight gain. But PEANUT BUTTER was there, and it wasn’t leaving. So, I caved people. I walked into my kitchen, slathered a bit on half a banana, and didn’t stop there. I took a piece of bread and slathered that crunchy peanut butter all over it and gobbled it down. 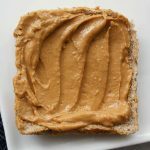 But let’s look on the bright side: For those times when I’m TRYING to gain weight, I’ve got a very quick, easy solution: PEANUT BUTTER… and lots of it.